Tep Vong, the great supreme patriarch of Cambodia’s Mohanikaya Buddhist sect, renewed his call Wednesday for monks not to vote or otherwise take part in the country’s elections, this time urging the government to put the restrictions into law. Speaking at the annual gathering of the country’s top monks in Phnom Penh, Tep Vong said the legislation was necessary to protect the national religion’s hallowed image. “I…ask the relevant establishments, the National Assembly, the Senate, the government and all political parties, to please create procedures to make the ordained monks and novice monks stay neutral…[and] avoid participating in activities that support or oppose any political party and participating in elections,” he said. Tep Vong, previously a senior member of the ruling CPP, has in the past issued personal orders forbidding the country’s more than 50,000 monks from voting. His new call for a law follows elections last year in which hundreds of monks campaigned openly for the opposition CNRP, which officially lost but came within seven parliamentary seats of victory. On Wednesday, just before requesting the voting ban, the Buddhist patriarch accused a few monks of threatening to drag the religion into disrepute. Bou Kry, supreme patriarch of the country’s smaller Dhammayuth sect, endorsed the call for a voting ban at the meeting. Chhoeng Bunchhea, deputy director-general of Buddhist education for the Mohanikaya sect, who also attended the meeting, said afterward that Cambodia needed the law to maintain peace. On election day last year, a brief but fiery riot broke out at a polling station in Phnom Penh after a young man allegedly assaulted a monk who was protesting against problems with the site’s voter list. CPP lawmaker Chheang Vun, spokesman for the National Assembly, said he welcomed the patriarch’s call for a law. “If there is a request for the monks to stay neutral and ban them from voting, I support it,” he said. Mr. Vun said the timing of the request was also fortuitous, with the CPP and CNRP set to negotiate an overhaul of the country’s election laws. The opposition, however, saw things differently. Son Chhay, a senior lawmaker for the CNRP, said it was Tep Vong who was taking sides, by demanding that monks’ right to cast a ballot be taken away. He said the Buddhist leader was merely doing the bidding of the CPP, which may be worried that its grip on the country’s pagodas will no longer be enough to keep the monks who live in them in line. Mr. Chhay said legally barring monks from voting would also take more than a few tweaks to the election laws. 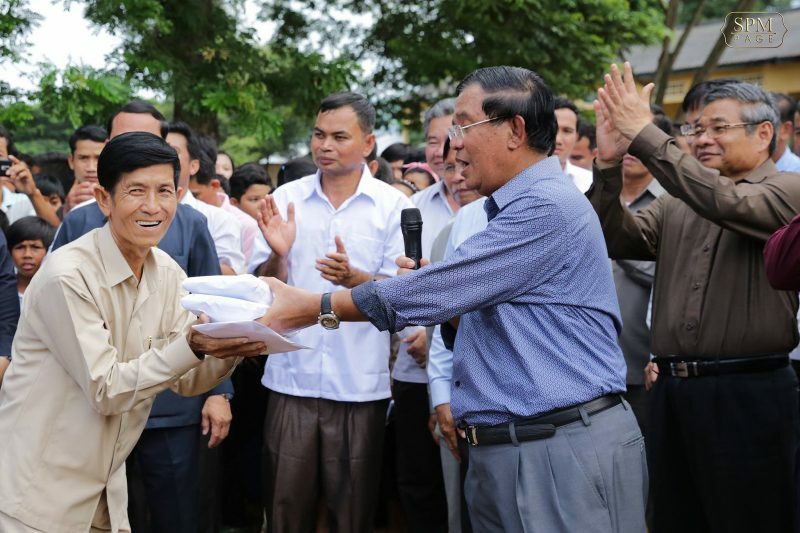 With the right to vote for every Cambodian citizen 18 years old and older enshrined in the Constitution, he said, it would take nothing less than a constitutional amendment. And that would take a two-thirds vote in the National Assembly. With the CPP well shy of controlling that many of the Assembly’s seats, Mr. Chhay said an amendment taking the right to vote away from monks was not likely to pass. Among the most vocal CPP critics in the clergy’s ranks in the past two years has been But Buntenh, who founded the Independent Monk Network for Social Justice as a counterpoint to a Buddhist establishment. Like Mr. Chhay, he called Tep Vong a puppet of the ruling party. And more than the monks alone, he said, the CPP fears that the public support of monks for other parties will sway the population. As for the standard complaint from the government and Buddhist leaders that activist monks threaten the country’s social order, But Buntenh said he and his cohorts were trying to set Cambodia back on the true Buddhist path—not stray from it—and that voting for the “right” leader was a part of that. “We are trying to have a person who has a high quality of virtue,” he said.